Next: Dusky Woodswallow » « Prev: Giving an evil eye? 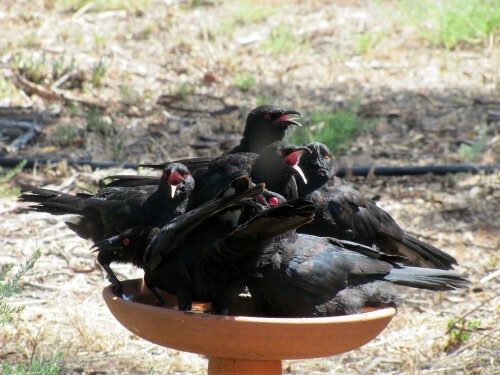 We have many different species come to visit our bird baths. They come either for a drink or for a bath – sometimes both. Many of these species are quite small, such as the thornbills and pardalotes. 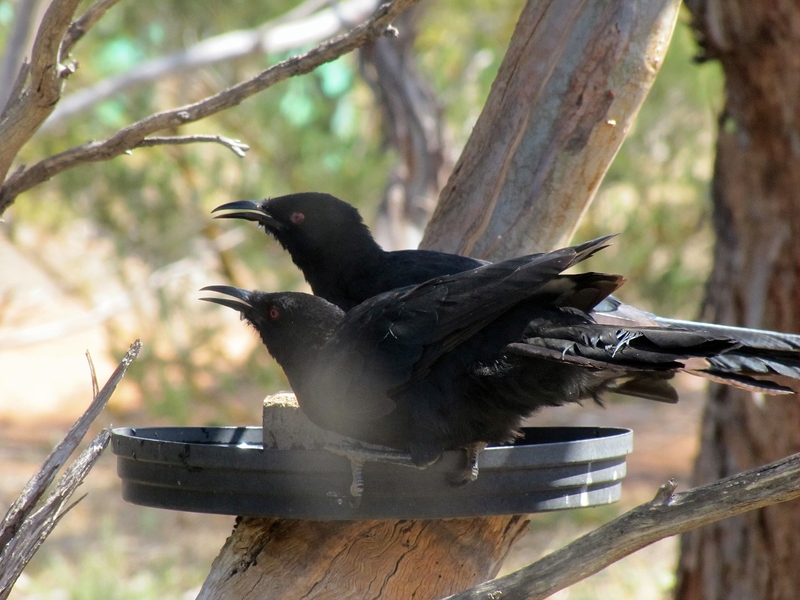 At the other end of the scale where size is considered would have to be the Little Ravens, Grey Currawongs and of course, the White-winged Choughs, featured in today’s photos. This series of photos was taken during our recent heat wave in South Australia. Our capital city Adelaide saw a 117 year record broken: 13 days over 40C over the summer, previously 11 days. Here in Murray Bridge we certainly have more than that. During hot weather the birds flock to the water throughout the day. Refilling the baths is a daily task. The White-winged Choughs all seem to crowd onto the one bird bath, each wanting a piece of the action. It is quite comical to witness the jostling and arguing over the prime positions. Sensible birds take up a position on one of the other bird baths nearby. I read your old post on ostriches and feral populations. I am doing some research on ostrich farming in Australia and I was told there was a farm near Wagga NSW in the mid 19th Century. I can’t find evidence of this in any of the local history books, but I thought if there were feral ostriches in the area it might indicate something. Wonder what your thoughts are? I probably can’t help you much with your research. There are occasional discussions about Australian feral populations of Ostrich on the Birding-Aus forum – the archives can be searched here http://birding-aus.org/ Currently the only known feral populations are near Port Augusta in SA and near Barham in SW New South Wales. Sorry that I can’t help you more. They are the clowns in our garden. They get up to all kinds of antics. When the magpies come near, however, there is quite a kerfuffle as they are not very tolerant towards one another. They both want to be the boss and that can only lead to trouble – noisy trouble. When it is really hot – like it has been recently – they lose all of their enthusiasm. 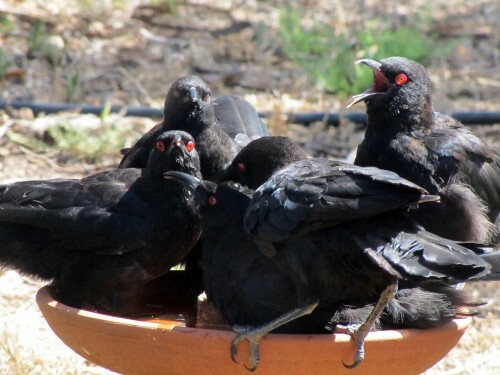 They will come to the bird baths and just flop down in the water. I’ve never seen them in “real life” Trevor, although my husband has & he’s told me about their antics. Sounds like there is never a dull moment at your place. I also over the years have enjoyed bird photography. Often i have an oportunity to see a variety of birds in my back yard here in Adelaide [ Hackham ] Whenever i travel away into the country side or Flinders Ranges I always take my camera with me.I also like good scenery . Several years ago i used to take my good friend Colin Barney late of Tailem Bend ON trips away in my caravan, he and i had much in common enjoying the countryside and each others company. Thanks for visiting and for leaving some comments. We love travelling our wonderful countryside too, sometimes in our caravan. So much country – so little time. In the last five years most of our trips have been from Murray Bridge to Sydney to spend time with our two grandchildren. The binoculars, field guide and camera accompany us on all trips.